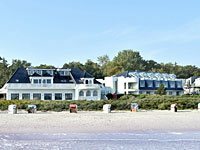 On behalf of Intus Hotels, I offer you a warm welcome to the Wellness Hotel Seeschlösschen, and I wish you a pleasant stay in Hohwacht on the Baltic Sea. Relax from the moment you arrive in the friendly atmosphere of our hotel where the hospitality of a dedicated team awaits you. Our hotel is ideally situated directly on the sea. Find out more about Hotel Seeschlösschen by taking a 360° tour. Whether you are a sports enthusiast, longing for the sun or merely looking for relaxation-you will get it all. With the flair of a fishing village, yet modern, the spa of Hohwacht on the Baltic Sea offers plenty of options for young families, couples and those travelling on their own. Our hotel offers 4 Star amenities. … to mention just a few of the facilities. We don’t charge any reservation fees, and there are no hidden provision fees.In case there is a problem, or you have any questions, you can get in touch with us directly and you don’t have to contact a third party.